Caves where shepherds “kept watch over their flock” still abound in the area east of Bethlehem. Here, the Gospel of Luke tells us, an angel announced the birth of Jesus. The angel’s good news was not given to the noble or pious, but to workers with a low reputation. Jewish literature ranked “shepherd” as among the most despised occupations of the time — but Christ was to identify himself with this occupation when he called himself “the Good Shepherd” (John 10:11). The traditional place of the angel’s visit is the town of Beit Sahur. Originally known as the Village of the Shepherds, it is now an eastern suburb of Bethlehem. 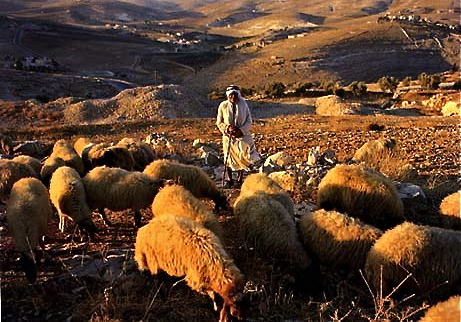 The tradition connected with the Shepherds’ Field is complicated by the fact that archaeologists have identified more than one possible site. • In the eastern part of Beit Sahur is a red-domed Greek Orthodox church at a site known as Kaniset el-Ruat (Church of the Shepherds). This site is identified with the biblical Tower of Edar (Tower of the Flock) where Jacob settled after his wife Rachel died. Eusebius (AD 265-340) says the tower, 1000 paces from Bethlehem, marked the place where the shepherds received the angel’s message. Excavations here have uncovered a series of remains dating back to a mosaic-floored 4th-century subterranean church, said to have been built by St Helena, the mother of the emperor Constantine. 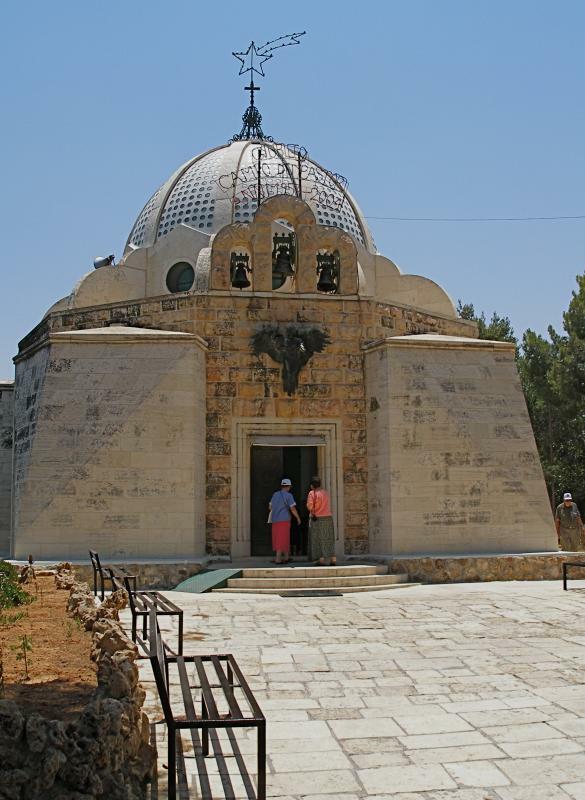 • On the north ridge of Beit Sahur, about 400 metres north of the Orthodox site, a Catholic site is located in an area called Siyar el-Ghanam (Place for Keeping Sheep). A tent-shaped Chapel of the Angels, designed by Italian architect Antonio Barluzzi, adjoins the remains of a 4th-century church and a later agricultural monastery. Paintings in the chapel depict the angel’s announcement to the shepherds, the shepherds paying homage to Jesus and the shepherds celebrating the birth of the Messiah. Beyond the chapel is a cave for small group worship. The area is administered by the Franciscans. • Eastwards from the Greek and Catholic churches is the Protestant Shepherd’s Field, a meadow filled with pine trees. Here a YMCA rehabilitation centre contains large caves with pottery remains. Beyond Shepherd’s Field to the east is the plain known as the Field of Boaz (or Field of Ruth). The “Field of Ruth” was really the field of Boaz, a wealthy landowner. She met him while gathering up the barley left behind by the harvesters. They married and she became the great-grandmother of King David.